a CallMiner LISTEN event is an industry leading event for customer engagement analytics professionals, bringing together top organisations using intelligence from interactions in the contact centre. Attend this FREE event to hear from analysts, executive thought leaders, and product innovators. 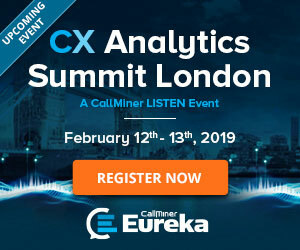 Learn best practices from the UK’s leading industries on how CallMiner Eureka is improving their sales, operations, agent performance and customer experience. Join us for this educational and interactive event including separate tracks for executives, business program owners and analysts. In these sessions for analysts, CallMiner experts will share approaches to solving complex problems with Eureka solutions.